After attending a group discussion on vCenter I left perplexed by what was shared of the product roadmap and current customer feedback. On reflection I wondered whether something big enough was on the horizon that they were deliberately throwing us off the scent as I couldn’t believe how some questions raised in the discussion were not recognised as problems. Virtualisation management is so incredibly important, customer experience is key. Although great steps are being taken to address some functionality gaps, vCenter design-wise remains the same which isn’t good enough any more. I’ll go through the discussion and then add my thoughts. Mohan Potheri and Madhup Gulati both from VMware led the discussion interactive by design rather than a presentation. They discussed migrating to the vCenter Appliance (VCSA), reiterating the maximums are the same for Windows and VCSA, There are currently export and import tools for the SQL data but it is still rather clunky. In the next version they are looking at having a much more seamless migration from Windows. VMware has Feature Walkthroughs to simulate what your upgrade will look like featurewalkthrough.vmware.com. VMware is going full steam ahead for the appliance and would like us all to join them. There were concerns raised about Update Manager, you can still have Update Manager as a separate installation on Windows connected to a VCSA. Good news is in 2016 Update Manager will be part of the VCSA, the UI integration is already done with vSphere 6.0 Update 1 and they’re working on porting the back-end code. They are also looking at the possibility of putting SRM in the VCSA appliance. VMware is also working hard on removing the need for the Flash requirement in the Web Client, look at Host Client HTML5 fling to get an idea. Also they are putting in some sort of higher availability for the next version of the VCSA. It sounded like an active-passive model. They said they also messed up and canned Heartbeat too soon without an alternative. They should have waited a year or two until a better native solution was available. They said the reason for canning it was the adoption of Heartbeat was so poor and was bad. I still find it incredible that for all the hard work they’ve been through to build a new vCenter with the VCSA they haven’t done some sort of scale out model. A golden opportunity lost when they preferred to port from Windows rather than be a little bolder. Madhup said that 5-10 minutes downtime should be something you should tolerate. I disagreed, if you are running a cloud or VDI environment, 10 minutes at 9am when no-one can deploy a VM or log on to their desktops would be a serious problem. They say this is a very hard problem to solve, agreed, but VMware prides itself on being a distributed systems company and they won’t build a distributed vCenter. I wasn’t impressed that this wasn’t recognised. I asked about GemFire as an example. They said vROps uses Gemfire but as the actual system of record is held in vCenter if something goes wrong with vROps it can just pull the info back from vCenter as the source. If vCenter was the source then what? I don’t know but please do something. Talk then moved on to the PSC and they went through some of the architectural details and deployment options. Then someone asked about the scale of PSCs. They mentioned they were running 17 Vblock racks which come with a vCenter per rack. Current vCenter PSC design is to not have more than 10 vCenters within a single PSC domain. The suggestion was to then split up your environment into multiple SSO domains, The questioner then mentioned that this would involve arbitrarily carving up their environment. I mentioned this would also mean you couldn’t vMotion across different vCenters in vSphere 6 if they were in different SSO domains. The presenters said this was a corner case at scale and wouldn’t impact many people. Not a very cloud scale answer was it? I also suggested being able to have embedded PSCs between 2 vCenters replicate with each other which is currently not recommended is a must have. This is a very common deployment with 2 data centers with say SRM. The feedback was, yes, we should look into that. I found that astounding. There must be a disconnect with customers and the vCenter product team if this is actually what they think. Recommending (never mind the grey area of not recommended vs. not supported) that you need to deploy an external PSC if you only have 2 x vCenters for a small deployment is silly. It seems the overall multi-year plan to pull out SSO, move it to a PSC and have various components plug into it is far too complex and elongated which means customers are faced with a new deployment architecture every year. if they upgrade. A few attendees fed back it would be great for vCenter to have a single operator view across on-premises + vCloud Air + vCloud Networks. VMware has seriously dropped the ball with vCenter which was once VMware’s crown jewel. The success of virtualisation was directly related to the ease of management and vCenter enabled this. As virtualisation has grown and enabled cloud, vCenter is showing its age, Still using Flash, bloated functionality, no included Update Manager, no High Availability other than HA and a too slow restart, complicated external load-balancer requirements for the PSC, horrendous certificate requirements. 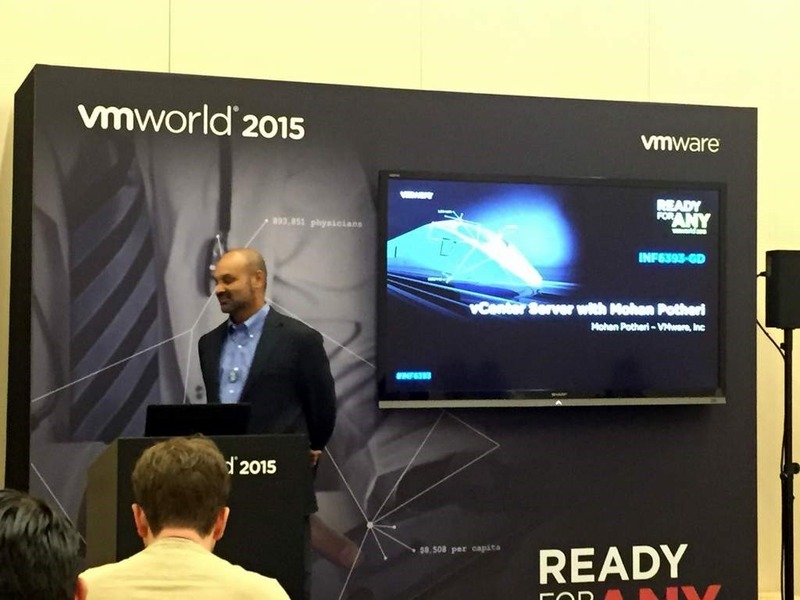 They had to build EVO:RAIL as a layer over vCenter to simplify the use of their own product! I’m optimistically hoping we were being fooled with this session and VMware is cooking up the most awesome HTML5 successor to vCenter but they can’t talk about it. Multi-cloud management and visibility, active/active highly available operations built in, transparently scale as you grow (think of those millions of containers to manage), trimmed down architecture and UI, move the stats/events/etc. into vROps if you need to, common APIs across vSphere/vCloud Air/vCloud Air Network. Have an option to have vCenter in the cloud, managing private resources with management and new functionality delivered as a service. Is this the future or am I dreaming? My thoughts have evolved and I think vCenter Server should be a distributed system with the functionality possibly residing in ESXi. This parallels what Nutanix have done with their Prism UI for Acropolis and I am impressed with it. How that architecture would address the requirements for PSC and VMware Identity Manager for the rest of VMware’s eco-system is another discussion for another day. However, I think we can all agree that VMware definitely has room to improve. I have heard rumours that some form of distributed vCenter Server is in the works, but they are completely unsubstantiated. Great article Julian, vCenter really is mission critical in VDI environments with non-persistent desktops. Quite a royal pain considering that you will need to get change control for anything that plugs into vCenter and also all your RBAC policies. Thanks, Rene, I had seen your post earlier in the year and wholeheartedly agree. With RAM and CPU cycles getting cheaper I could certainly see a vCenter putting more functionality into ESXi itself (DRS,SPBM,API Access) and then pulling out the non-critical performance/events/compliance/etc. stuff into something else, local or public cloud. and what worries me more was in the group discussion I didn’t get the impression that these concerns were acknowedged (the rest of VMware must be in dispair too), they seemed defensive in protecting how vCenter currently works rather than disruption which is apparently all the rage nowadays! Thanks for reading. Yes, there are just way too many moving parts and that’s OK if your central management strategy is consistent, just upgrade the central thing and the other things that connect like SRM continue to connect. Problem is, the central management isn’t consistent, the goal posts keep changing and even minor versions require a central management rearchitecture. Every point is spot on. I raised the same issues at VMworld US this year and got disappointing responses from the VMware team. We are a Service Provider and have been using a product by Artisan Infrastructure to protect the vCenter, the brand is Neverfail and this allows us to provide real-time replication and fail-over to our customers for the vCenter server. Their newest version is very easy to install compared to the older versions. It does a great job with a HA and DR/tertiary design for both on-site and off-site. The built in WAN compression really does a great job and it can protect any windows application. We have been a long standing partner of Artisan Infrastructure and have been really excited about their acquisition of the Neverfail continuous application availability product for all of our clients. I also wish that the new vSphere web client was not so horrendous reminds me of an old 486dx with an IDE drive and a spinning wheel everytime I try to change screens..
100% agree. VMware have taken too many bad decisions over the years now, vCenter roadmap being one of the worst.